LA PUENTE – The voices of two singers echo throughout the Carroll Center. Students turn to see altar servers and gift bearers process towards the altar. Behind them is Father John Montejano, carrying the prayer book into mass above his head for all to see. This is the first image of Fr. 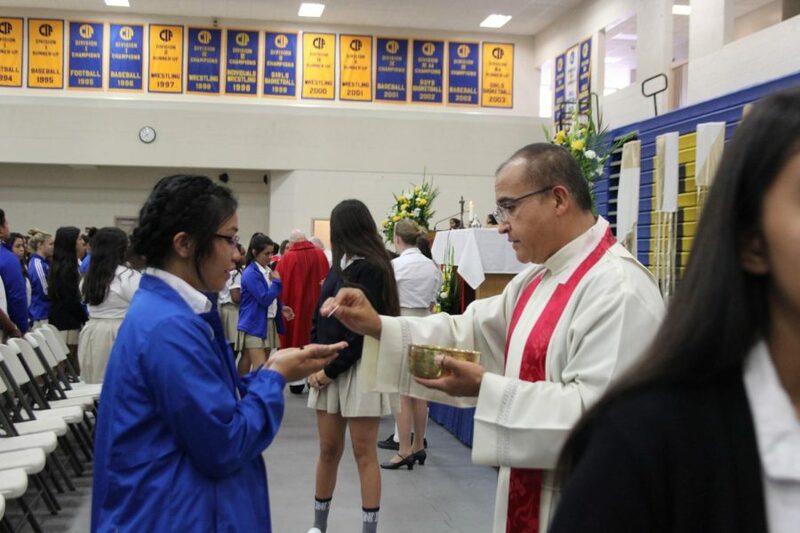 John students see: a devoted servant of Christ setting an example of faith the Amat community. Fr. John, who joined the Bishop Amat family this year as the new school chaplain, isn’t new to working with teenagers. In his years as a parish priest, Fr. John helped establish the Life Teen, a very popular youth movement, in California. “Life Teen is a movement that brings teens into the church by helping them learn to love Jesus and the sacraments,” Fr. John said. Many parishes around the school, including St. John the Baptist in Baldwin Park where he served as pastor and St. Martha’s in Valinda, have Life Teen programs. Religion teacher Ms. Marlene Pinel, who has known Father John for almost two decades and witnessed the success of the Life Teen programs, thinks he’s going to do really well at the school. Outside of his parish experience, Fr. John studied Canon Law and church administration in Rome for three years, where he learned to speak Italian. This experience allowed Father John to meet priests from around the world. Following this opportunity, Fr. John worked in the Los Angeles Archdiocese for five years training seminarians. When the bishop appointed Fr. John Montejano to continue his work at Bishop Amat by the Archdiocese, the new chaplain was surprised. But he’s welcomed the experience. “Working at Amat is a part of God’s plan,” he said. These goals relate to his motivation for progressing the Life Teen movement. Amat expects great things from Fr. John’s influence this year.